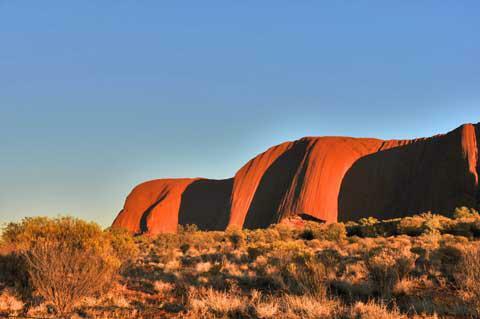 How much does it cost to travel to Uluru National Park (Ayers Rock)? How much money will you need in Uluru National Park (Ayers Rock)? AU$186 ($133) is the average daily price for traveling in Uluru National Park (Ayers Rock). The average price of food for one day is AU$57 ($41). The average price of a hotel for a couple is AU$143 ($102). Additional pricing is in the table below. These average travel prices have been collected from other travelers to help you plan your own travel budget. How expensive is Uluru National Park (Ayers Rock)? The Australian countryside is a large and vast area just waiting to be explored. Located in the north of Australia, Uluru-Kata Tjuta National Park is a part of the Red Centre of the country. It is an UNESCO World Heritage Site, and, according to the Aborigines, it is a very sacred space. Amazing geological wonders and fascinating wildlife are just waiting for your visit. Be aware that the seasons down under are swapped. December and January can be sweltering in Australia, while July and August are absolutely frigid at night. The most agreeable weather for your visit will be in April or September. The park is most known for its namesakes. The Uluru is one of Australia's most famous natural formations. The long domed rock, or giant boulder, expands 5 kilometers beneath the desert surface and 348 meters above it. The beautiful colors seen in these formations change throughout the day. This sight is so iconic it has become one of the national symbols for Australia. Kata Tjuta is the other most known formation in this park. These 36 variously sized rock domes are located 36 kilometers west of Uluru. Many believe this area was once an even larger rock dome that has been worn down by erosion over the centuries. However, to start your day in this wonderful national park, make your first stop the Cultural Centre. Here you will learn about Aboriginal creation stories, and see articles about the history and sacredness of the area. Another option for an amazing start to the day is to head to Talinguru Nyakuntjaku. It literally means "place to look from the sand dune," and it is where you will experience one of the most beautiful sunrises of your life. This place is a hiker's dream come true. The Uluru-Kata Tjuta National Park is full of scenic trails and challenging climbs all ready for the right adventurer. The Uluru Base Walk is 9.8 kilometers and takes approximately three to four hours to finish. The beginning of this trek is a bit crowded, but as you continue the crowds thin out to occasional walkers. The Mala Walk is for the traveler looking for a lighter trek. At only two kilometers long, the trail goes from the parking lot to breathtaking Kantju Gorge. The Liru Walk begins at the Cultural Centre and spans 4 kilometers to the base of Uluru. Set aside an hour and a half for this walk. The Kuniya Walk is an easier, one-kilometer walk on the southern side of Uluru ending at the Mutitjulu Waterhole. The Valley of the Winds Walk is a single path taking about three hours to complete. As you travel between two stunning lookout points in Kata Tjuta. Carrying water is highly recommended. Your best bet is to hit the trail during the morning hours  you'll avoid the crowds and have a better chance at seeing wildlife. For a spectacular view you can arrange a helicopter tour at Yulara. Spend as much time as you want in the sky with tours ranging from a quick trip over the park to longer trips extending all the way to King's Canyon. Another special way to enjoy the Uluru-Kata Tjuta National Park is by camel ride. As you experience the incredible views and natural wonders, you'll hear stories of camel history and the surrounding area. The Cultural Center is full of plenty of fast food options and small stores for snacks. Be sure to stock up on water for the day here. For a truly unique experience, however, try to book a spot at the Sounds of Silence for dinner. Enjoy a dinner in the desert as you watch the sunset to the sounds of the traditional didgeridoo. Let the star talker explain the various constellations in the sky and look through the telescopes after your meal. This special meal can be arranged through tour companies or hotels. It's an experience not to be missed. Getting around the Uluru-Kata Tjuta National Park is pretty simple as long as you are part of a tour or have your own transportation. There are care rentals and tours available when you arrive. Bear in mind, hired cars and shuttles transporting to and from formations are available  but they can be a little pricey. Uluru and Kata Tjuta are sacred sites for the aboriginal people. The land is still owned by the Anangu, but it is leased by the Australian government. Management is done through a partnership of the Anangu and the Australian parks and management service. There are obvious effects in the park to respect the views of the Anangu people. In particular, specific areas of Kata Tjuta is off limits and the discourage people from climbing Uluru with postings and information about the sacredness of the rock to the people. There are a view places where photography is not allowed so pay attention. Rules are generally enforced by the Australian parks department.